The White House and State Department have said little about those talks, though people briefed on them said American negotiators found it difficult to make significant headway with the North Koreans, in part because the White House did not back them up in taking a hard line. In his public statements, Mr. Trump has shown gradually greater flexibility toward North Korea, saying he viewed its disarmament as a “process,” rather than something to be done all at once, and disavowing the phrase “maximum pressure,” after making it the centerpiece of his policy. 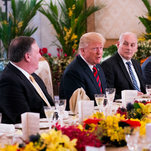 Some foreign-policy experts said the breakdown at the Group of 7 meeting would play to North Korea’s advantage, since Mr. Trump can ill afford a second failed summit, back to back. The president has consistently predicted success, even as his definition of that has grown foggier. Still, other analysts said Mr. Kim was as determined as Mr. Trump to make this meeting a success. That, as much as Mr. Trump’s need for a win after Canada, may guarantee a positive outcome.